Steal, and you go to prison. But loot cultural artifacts? Museums have thrived off the practice for centuries. Take a stroll through some of the major museums in the world – the Metropolitan Museum of Art in New York, the British Museum, the Pergamon in Berlin – and ask yourself what they have in common. Answer: Halls full of artifacts with disputed ownership. In this more enlightened age we live in, this clearly has to change. And how that change takes place will have major ramifications for collections of antiquities in legacy museums like those in London, Berlin and Paris. Meanwhile, new ethical protocols are being established by new museums, such as the Louvre Abu Dhabi. Perhaps I’m too scathing in my judgment of previous international museum acquisition practices, since most of the material that museums hold in their collections are donated or purchased from private collectors. Yet, it is also true that many collectors – particularly those from the period of European colonialism – purchased artwork and historical artifacts in less than completely ethical circumstances. I’m not looking to incriminate museums for how they acquired art in the past, though I do think there should be more care taken in future acquisitions. Many, if not all, of the major museums in the world have items in their collections with contested ownership. Those complicated pasts now are haunting the present. Just this month, Tarita Alarcón Rapu, the governor of Easter Island, met with British Museum executives to parley over the return of Hoa Hakananai’a, a stone monolith said to be among the most important of those from the Chilean island and its people. The four-tonne object, called a “moai,” is said to represent tribal leaders or deified ancestors. Hoa Hakananai’a was taken in the 19thcentury by sailors from the British Navy and “given” to Queen Victoria. It has been in the hands of the British Museum for over 150 years. Again, I’m not here to judge Britain’s colonial past – at least in the matter of museums – but what I find troubling is that when it was asked to return the artifact, the museum offered to “loan” it. It is offensive, in bad taste and bad faith for the British Museum to offer to loan the monolith to Easter Island, when that is where the monolith was unrightfully taken from. Of course, returning an artifact that has been in a museum for over a century is a complex matter, but this is not an isolated incident. The British Museum has form. Greece has asked for the return of what the British call the Elgin marbles (the Greeks call them the Parthenon marbles), and Nigeria for what are called the Benin Bronzes (the museum has, again, offered to “loan” these to a museum being built in Nigeria; I sense a pattern). Clearly, the moment has come to deal with the complicated nature of the ownership of historical artifacts. In making its defense, the British Museum offered this excuse: “The Museum is a unique resource for the world: the breadth and depth of its collection allow a global public to examine cultural identities and explore the complex network of interconnected human cultures.” In other words, it claims to offer a service to the world as the focal point of global culture. Come to London and see the patrimony of the world – saving the cultural tourist from having to troop out to Egypt, Iraq, Turkey, Greece, the Pacific islands and so on. The British Museum offers itself up as a one-stop shop for universal culture. Across the Channel in France, however, President Emmanuel Macron is taking the lead in a more enlightened approach and has promised to return “without delay” 26 artifacts taken from Benin itself during the colonial period. The Elysee palace has stressed that this would not be a one-off case. Indeed, the announcement follows the release of a report by experts in the field who recommend that Africa’s heritage objects should be returned to their home countries. What will all this mean for museums? Will exhibition halls fall empty? Not quite. There is, in fact, an opportunity to start a new paradigm in museum curation. Poorer nations should be able to put a price to “rent” out their priceless treasures. Curators can work to produce traveling shows of historical artifacts, allowing museums to fill space and nations to show off their culture. In addition, the Louvre Abu Dhabi, as a new museum, offers another model in exhibition protocol, whereby its own collection is supplemented by an active rotation of loan items. For example, a current show, Roads of Arabia: Archaeological Treasures of Saudi Arabia, is a collection of pieces from the Gulf region, owned by the Gulf region. 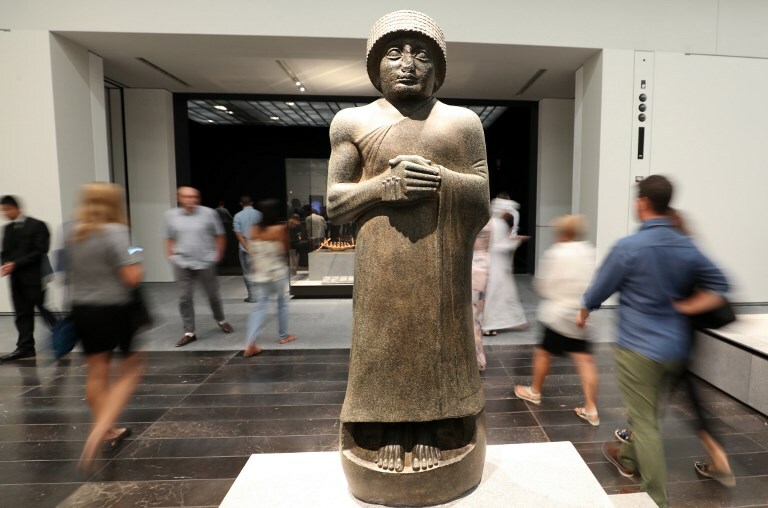 In such a manner, the Louvre Abu Dhabi offers its visitors glimpses of world culture without entering into the fraught debate over ownership. As a bonus for visitors, an active loan schedule means there is always something new to see. Museums cannot any more function like appendages of the colonial project. It is time to blow off the cobweb and change. To be sure, there are difficult subjects still to consider, such as what to do about objects from countries fighting wars and which cannot care for them? That is indeed a difficult one, but I’m fairly sure the answer is not to take the opportunity to steal the artifacts.